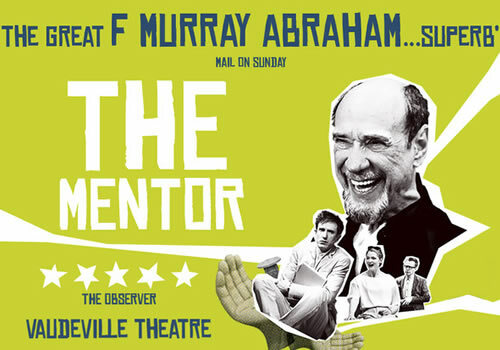 Tony and Olivier Award-winning Laurence Boswell directs Daniel Kehlmann’s play The Mentor, transferring to the Vaudeville Theatre following a hugely successful run at the Theatre Royal Bath. Starring Academy Award-winning actor F. Murray Abraham, the compelling comedy plays a limited season at the West End venue, beginning in June. Set in the heart of the German countryside, The Mentor follows cantankerous writer Benjamin Robin, who continues to bask in the success of his previous years. When Martin Wegner, a rising literary star, comes under his mentorship, egos and personalities collide in this captivating comedy that sees a fight about art, artists and the legacy of fame. F. Murray Abraham stars as Benjamin Murray, with previous credits including his Academy Award-winning role as Salieri in the 1983 film Amadeus, as well as Homeland, Star Trek: Insurrection, Scarface and The Grand Budapest Hotel. Broadway credits include the recent It’s Only a Play, as well as Angels in America and A Month in the Country. Further casting includes Daniel Weyman (Nicholas Nickleby, King Lear) as Martin Wegner, Naomi Frederick as Gina Wegner and Jonathan Cullen as Erwin Rudicek. The Mentor is directed by Laurence Boswell, Artistic Director of the Ustinov Studio Bath, with design by Polly Sullivan, lighting design by Colin Grenfell and original music by Dave Price. Daniel Kehlmann’s play is translated from German by Christopher Hampton, who also translation Florian Zeller’s The Father. Playing a limited season at the Vaudeville Theatre, The Mentor runs from June 24th to September 2nd, with a press night on July 4th 2017. The Mentor may not be suitable for young children.